NEW YORK— Every summer, New York is brimming with public art and this year the selection is particularly well curated. Five of the most compelling installations include a couple of big names and some impressive concepts: Jeff Koons at Rockefeller Center; Kara Walker in Williamsburg, Brooklyn; Alice Aycock on Park Avenue; Chakaia Booker on Broadway in the Garment District; and Olaf Breuning near Central Park South and Fifth Avenue. 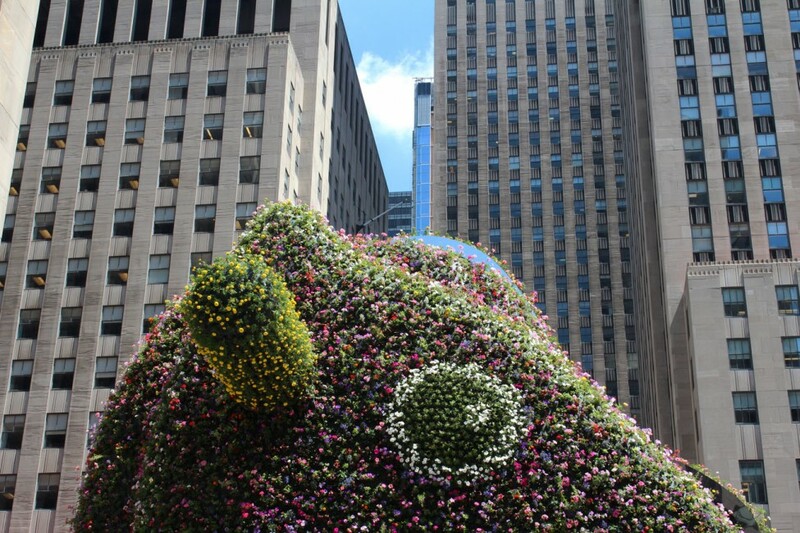 A few weeks ago, “Split-Rocker,” an enormous “topiary” by Koons debuted at Rockefeller Center where the famous Christmas tree is displayed during the holidays. The installation coincides with the Koons exhibition that just opened at The Whitney Museum of American Art. “A Subtlety” in Brooklyn is Walker’s first public art work. The much-buzzed-about sugar sphinx at the Domino Sugar Factory in Brooklyn closes this weekend and has attracted an impressive 100,000 visitors, according the The New York Times. Beyond its popularity, the installation, a monument to the slaves who fortified the sugar industry, is by far the most thought-provoking public art work to grace the city in some time. 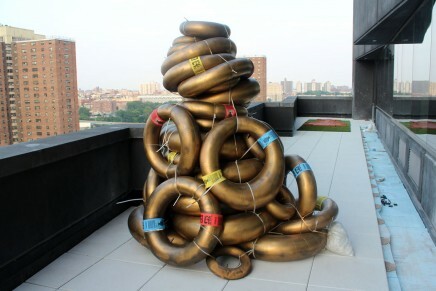 “Cyclone Twist,” 2013 (painted aluminum), part of a series of seven sculptures by Alice Aycock. 1. 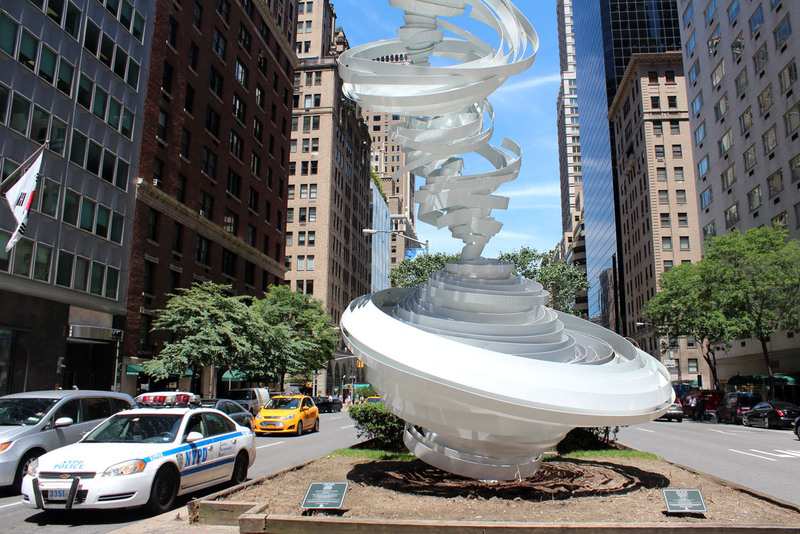 Alice Aycock has transformed the Park Avenue corridor between 52th and 66th streets with bright white wind-swept bursts and swirls with dynamic names such as vortex, maelstrom and cyclone. 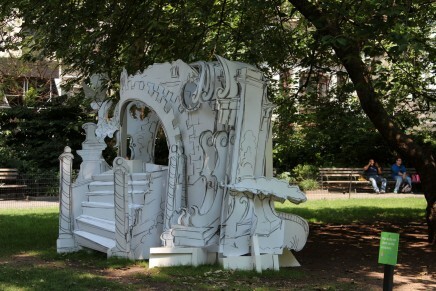 Presented by the Sculpture Committee of the Fund for Park Avenue and New York’s Department of Parks and Recreation, “Park Avenue Paper Chase,” a series of seven painted aluminum, steel and reinforced fiberglass sculptures, was installed in March and is on view through July 20, 2014. Detail of “Shape Shifter,” 2012 (rubber tires and stainless steel), included in a group of five sculptures by Chakaia Booker. 2. 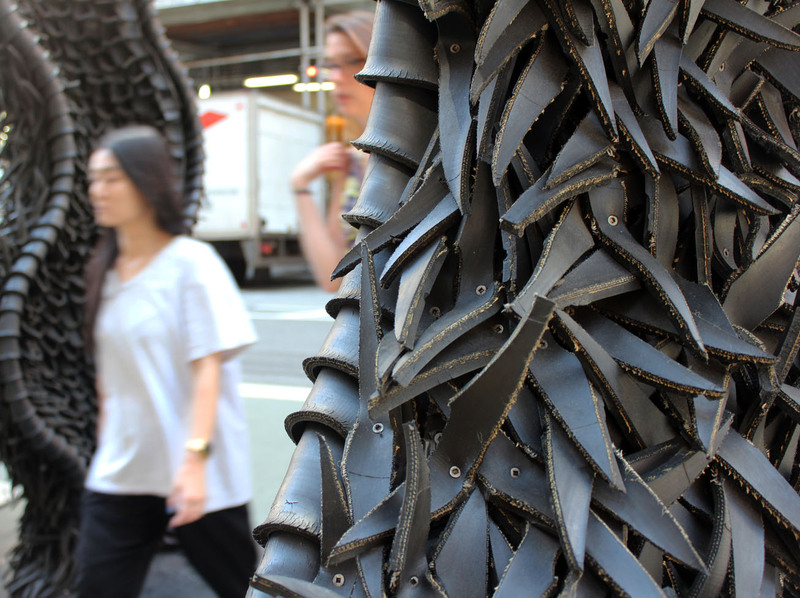 Chakaia Booker uses recycled rubber tires to create the layered and textured surfaces that define her sculptures. “The Sentinels,” a group of five works on Broadway between 36th and 41st streets in the Garment District, includes “LBD Duty Free,” a new sculpture produced for the exhibition. 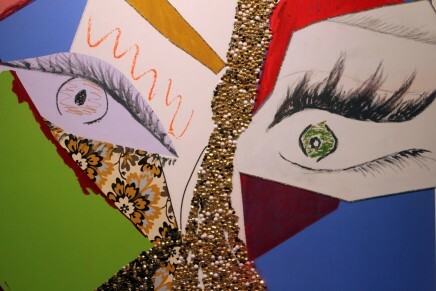 Presented by the Garment District Alliance, the installation opened on June 5 and is on view through mid-November 2014. 3. 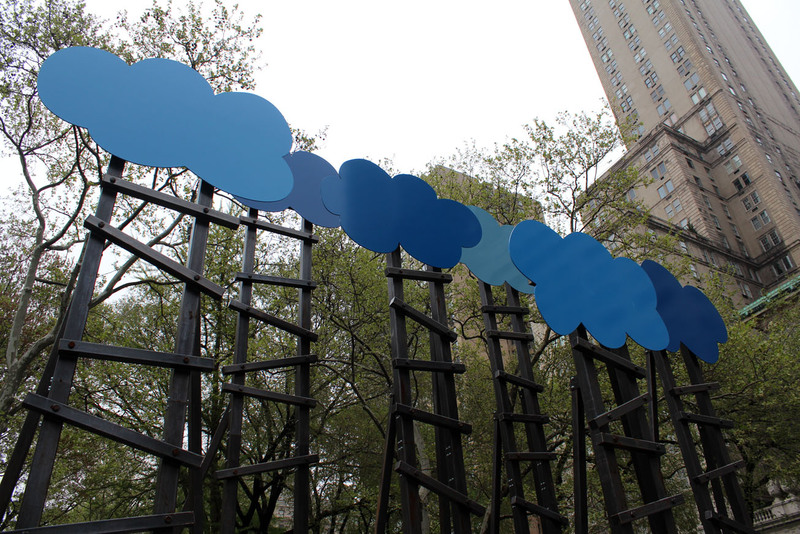 Olaf Breuning has been manipulating the forecast at Central Park South for months now with his whimsical, pop art take on sky blue clouds. Perched nearly 35-feet high among the trees, “Clouds” is presented by the Public Art Fund and is on view from March 4 to Aug. 24. 2014. 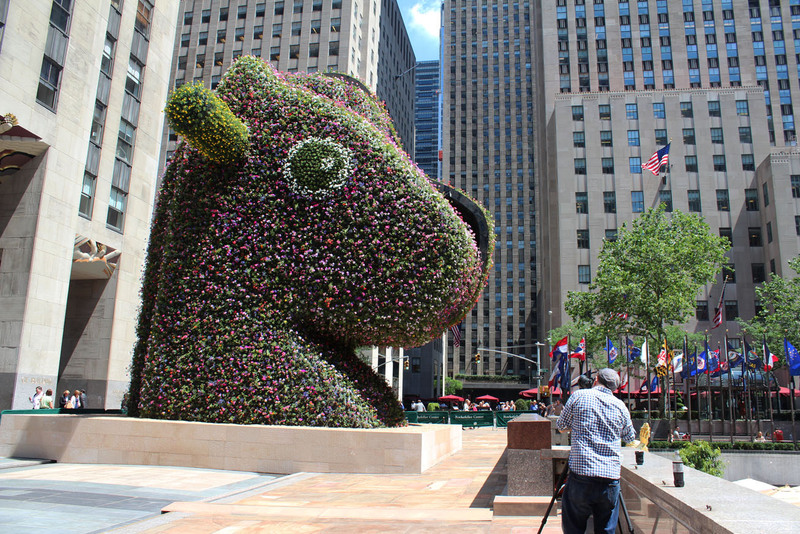 “Split Rocker,” first exhibited in 2000 (50,000 flowering plants) by Jeff Koons. 4. Jeff Koons often produces works that look like huge toys executed with unexpected materials. “Split-Rocker” at Rockefeller Center replicates the split head of a rocking horse and composed 50,000 flowering plants, rises 37 feet high. Making its New York debut, the installation began taking shape at the end of May and is on view through Sept. 12, 2014. Installation view of “A Subtlety,” 2014 (styrofoam, sugar) by Kara Walker. 5. 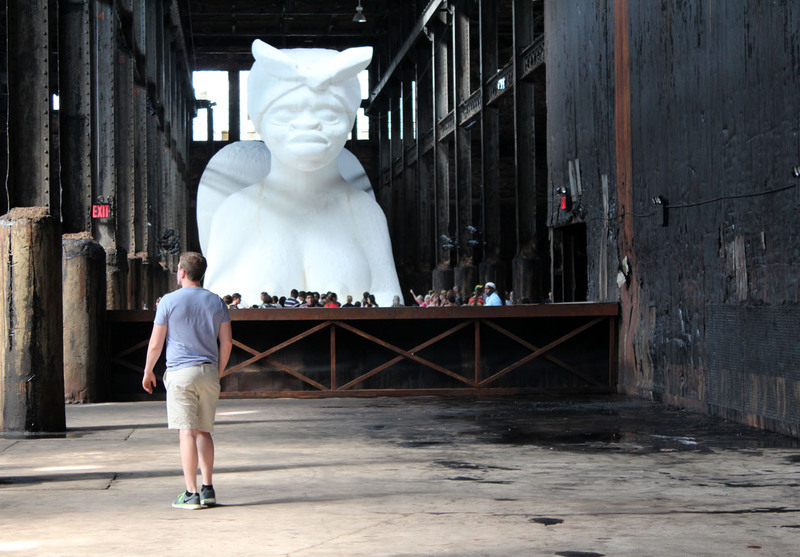 Kara Walker was commissioned by the public arts organization Creative Time to produce an installation at the old Domino Sugar Factory in Williamsburg, Brooklyn, before the symbolic structure is demolished by developers. She created a monumental spectacle—an homage to the slave labor that propped up the sugar industry—that has defied expectations, stunned the art world and attracted impressive crowds since its unveiling. “A Subtlety” opened on May 10 and closed this weekend, on Sunday, July 6, 2014.